Ocala Metal Roofing Contractor – Ocala Restoration and Remodeling. Discover the benefits of metal roofing and why thousands of homeowners each year are choosing to upgrade to a new metal roof. Although asphalt roof shingles are the most popular roofing products in the United States, these roofing materials do not have the durability of metal roofing. A metal roof will cost more than asphalt roofing initially but will save the homeowner money over time. Because metal roofing is designed to last a lifetime, saving the cost of re-roofing several times with asphalt shingles. Metal roofing will also keep your home cooler in the summer and warmer in the winter, reducing your energy cost. Metal roofs reflect the suns rays and do not absorb heat like traditional asphalt roofing. This is due to the highly reflective and highly emissive paint on metal roofing, which can re-emit up to 90% of absorbed solar radiation. In addition, a metal in most cases can be installed directly over an existing asphalt roof; saving the expense of having the old roof removed, as well as the environmental impact of disposal.With a metal roof, you will start seeing the savings immediately after your metal roof is installed. Furthermore, metal roofing is a corrosion resistant and recyclable roofing product that is noncombustible, which makes it perfectly suited for today’s lifestyles, and environmental priorities. It has outstanding durability and is suitable for extreme weather conditions. Quick installation and longer life expectancy. Reflects heat from the sun. 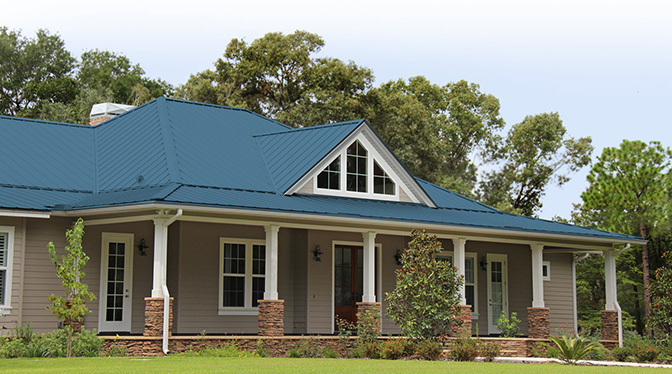 We are your Ocala metal roofing experts! Ocala Restorations and Remodeling strives to provide quality roofing products at the best prices; one of our specialty is providing and installing metal roofing systems for our Ocala neighbors. From estimation to completion, our roofing team is ready to handle all your roofing needs. Contact the Ocala metal roof experts at Ocala Restoration and Remodeling by calling the number below. You can also send us an email with any questions you may have.